Linda Andersen – we miss you! 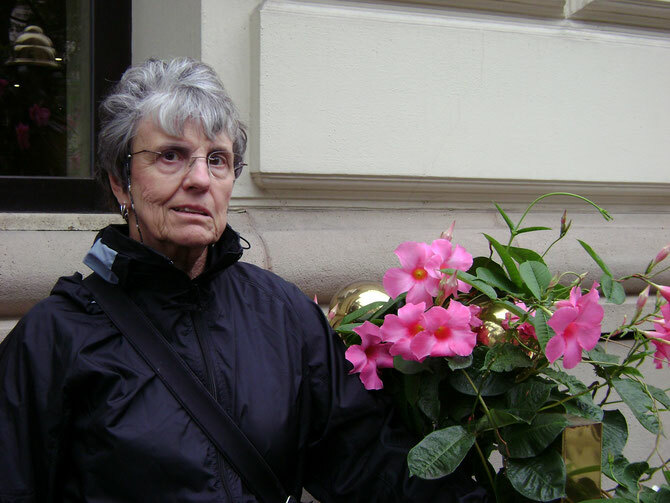 Linda, an active, healthy 73-year-old, was diagnosed with rectal cancer in May 2014. Her gastroenterologist found polyps while performing a routine colonoscopy. When relaying her diagnosis to family and friends, Linda made light of it. The good news, she said, was her cancer was curable; the bad news was that she and her husband, Bill, would have to remain in hot Goodyear, Arizona during her treatment. Treatment (96-hour infusion of 5-FU (fluorouracil) concurrent with radiation (five days a week for 7 weeks) began on June 9, 2014. With deep and overwhelming sadness, Linda’s family lost her on July 2, 2014 due to toxicity caused by 5-FU after fighting for her life in ICU since June 19, 2014. Why such a significant dose without seeing if she could tolerate fluorouracil? Our hope is that through her unnecessary death, the National Comprehensive Cancer Network and the FDA will put positive changes to chemotherapy treatment into place. Linda Karen Andersen (Schroeder- her last name after marrying Bill Schroeder) had a playful spirit and an easygoing, friendly disposition. Steve, her eldest son, felt she was almost impossible to anger. She was brave and resilient. Linda was energetic and ready to work hard to take on challenges or new adventures. She gave her kids the sense of wanting to make sure everyone was treated fairly and with respect. We will remember her as being so easy to be around and so hard to live without. Linda’s 96-hour 5-FU infusion began on Monday, June 9, 2014. She knew the effects of chemotherapy on her body were going to cause some suffering. Yet none of her family felt that her chemotherapy would take her life. By Saturday, June 14, 2014, Linda had not been able to keep any food or fluids down. Having been an RN she knew she needed to go to the ER for fluids rather than waiting until her hydration appointment on Monday, June 16th. Her oncologist agreed with her and recommended she go to the ER for hydration. At the ER, Linda was given fluids for hydration. In hindsight, if the ER personnel had been educated to check for signs of 5-FU toxicity, they could have alerted her oncologist, or if an oncologist had observed her atypical reaction to the 5-FU then perhaps this story would have a different ending. Linda and her husband went home from the ER Saturday, but her condition did not improve. In fact her mucositis continued to worsen and she was very weak. During the night on June 18, 2014, Linda got out of bed and was unable to stand up. Her husband called 911 and she was taken to the hospital. By this time her mouth and throat were so sore that she could barely talk or eat. Her doctors considered her condition as guarded, not critical, and informed us that her response to 5-FU was much worse than normal. The doctors said they would use another chemo drug for her second round of chemo in early July. At this point we knew she was in a danger zone due to the severe toxicity. Linda had a kidney doctor, lung doctor and infectious disease doctor on top of the oncologist. The key factor was her low white blood cell counts. She remained at less than .1 We were holding out hope each day that her white blood cell count would improve. The oncologist stated that he felt we should start to see improvement over the next couple of days but the white blood cell count is the key. He stated that it would be 2 to 3 weeks for her here at the hospital after her white blood cell count begins to rise. During doctor rounds on June 26, 2014, the oncologist let us know that Linda is critically ill and has sepsis due to the toxicity. He has not seen this reaction in 4 years and it is extremely rare. He believes this severe toxicity is due to DPD deficiency but will not know for sure until we confirm at a later date. Over the several days she had family members with her at all times, except when the nurses needed them out to change the bed. Waiting for the white blood cell count to improve. Each morning we were anxious to get the morning lab report results. Her vital organs were all stable considering the stress her body was under. On the evening of July 2, 2014, Linda’s blood pressure and blood oxygen level dropped. Doctors were able to get them both back up with the ventilator but the lactic acid level in her blood was high. The increasing lactic acid caused her blood pressure to drop until her heart muscle was not able to get enough blood and stopped beating. At 8:50 pm on July 2, 2014, our beloved Linda passed away. She left behind a devastated family: loving husband, 5 children, 15 grandchildren, 1 great grandchild, 3 sisters, 2 brothers and countless friends. With way too much effort than should have been necessary, her family moved quickly over the 4th of July weekend to get one of Linda’s few blood samples left at the hospital over to Lab Corp to have it tested for DPD deficiency. They tested for only one gene mutation: IVS14+1 G>A mutation (*2A). She did not have DPD deficiency, at least not this mutation yet her body did not tolerate fluorouracil. More research is necessary to determine what other gene mutations give evidence of DPD deficiency. It’s bad enough to lose a loved one to cancer, but it is devastating to lose a loved one due to medicine administered to treat cancer.